What is The End of Eddy about? The End of Eddy is based on a book by French writer Edouard Louis, which caused a sensation in Europe, about growing up in a little town in northern France. It’s a very working-class place where genders have to play their roles – the men have to be macho and the women have to be subservient. Edouard realises he’s not like the other boys – and the book is an exploration of that. He was severely bullied at school and ends up feeling he has to leave. He goes to art college, but does not completely fit in there. How does it work as a two-hander? We use small screens for the other characters, which are played by me and my co-star Alex Austin. We also share the role of Eddy. It’s quite interesting that I’m a black performer and Alex is white. There’s a lot of racism in the book and we discuss this in the play. 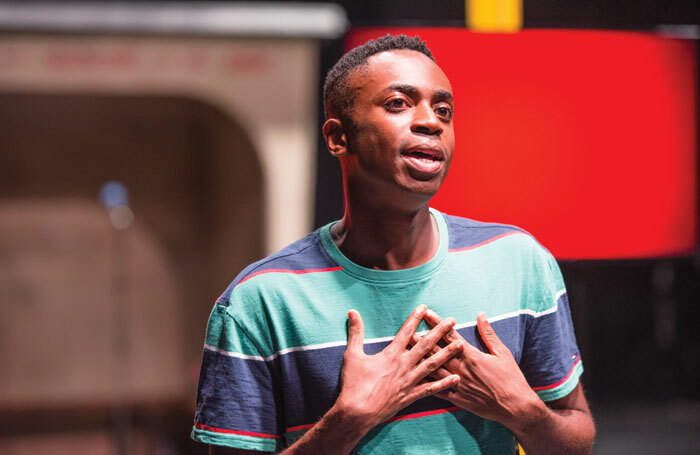 It’s important there is a person of colour in the cast – as it can be very uncomfortable and otherwise you would not be representing the people the play is talking about. Also, outside of the play, the thing we are always talking about in the industry is diversity. Why is it important to tell stories like The End of Eddy in theatre? It’s about a young boy discovering his sexuality, and it’s important to be able to talk about that openly. It’s really about finding a sense of yourself and feeling love for yourself. He comes from a world in which he does not feel like he has a place. Feeling you have to escape something or change something about yourself is something we all go through. I was lucky enough to go to a school that promoted the theatre. I grew up in south London and went to Dulwich College, where the drama teachers were amazing. It was something I enjoyed, but I wasn’t sure if it was a possible career. I went to Warwick University, where I studied English, and did a lot of drama there. In my third year, I applied for a job in advertising and started making BT adverts in that job. I did that for a couple of years, but I knew I wanted to move towards theatre. I then worked for English Touring Theatre for two years as a production assistant. I got to work on the shows right from the beginning, which gave me an overview of what this industry is like. I decided that I wanted to act and applied in 2014 and got into RADA. I can’t believe it’s finished. I just graduated this summer – three years have gone. I’m a big believer that it’s important to have life experience before you settle on one thing. This is my first professional job in the industry. I was lucky enough to get an agent at RADA and this was actually my first theatre audition – so I was really, really nervous. I was so shocked to get it.